Rockland County Executive Ed Day announced today that for the first time in a decade Rockland’s bonds are in the “A” category, a clear sign that fiscal policies he put into place are paying off for taxpayers. 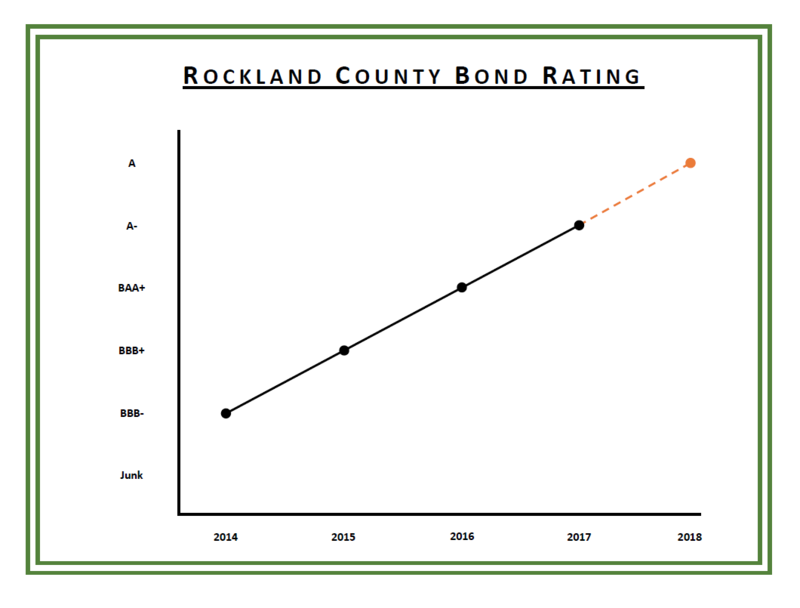 The “A-“ rating by Fitch is the county’s fifth consecutive bond upgrade since 2014, when Rockland’s bonds were rated just above junk and the county had a $138 million deficit. For a $30 million new issue 20-year-bond the difference between an “A” rating and a “B” rating is between $350,000 and $500,000, according to Rockland Commissioner of Finance Stephen DeGroat. Rockland County has saved between $3 to $5 million in debt service since 2014. Rockland County’s improved financial health has earned the trust of the financial markets, which are willing to pay a premium to invest in the county. Rockland earned $11 million in premiums from its $96 million deficit reduction bond sale and $20 million in total premiums on all bond sales since 2014. The County Executive said that Rockland’s improved finances are a result of the efforts of many people. “We thanks all of our talented and hardworking county employees, who have learned to do things differently, often more efficiently,” he said. The size of county government has been reduced by 22 percent and spending has been cut by 9 percent. Rockland is now seeing the payoff in terms of greater financial stability and an improved bond rating, he said. “We are poised to move into the future with our finances in top shape,” he said. The County Executive noted that the Fitch analysts rated Rockland’s bonds as “A-” with a stable outlook. They made the rating with the expectation that that the county will eliminate its deficit and build up reserves. Sale of the county-owned Sain building for $4.51 million would allow the county to reduce its remaining $10 million deficit by 40 percent. “This new rating is further evidence that the difficult decisions made by the Legislature have continued to help turn things around when it comes to our finances,” Legislature Chairman Toney L. Earl said. “But many issues remain, including paying down the rest of the deficit and reducing our fiscal stress score so that we are no longer considered strained,” Earl said. Fitch is one of several rating companies that issue scores regarding the credit-worthiness of Rockland County, the others being Moody’s and S&P Global Rating. Rockland’s credit score once stood just three positions above junk status as the recession took a heavy toll, in good part because, at the time, the county over-relied on more volatile sales tax revenue instead of more dependable property tax revenue, according to the state Comptroller’s Office. The Legislature approved a deficit reduction bond in 2014 in the amount of about $96 million to quickly pay down a major portion of the county’s approximate $138 million budget deficit. The loan dramatically improved cash flow, which had a direct impact on the county’s fiscal stress score. The bond is in process of being paid off. The Legislature has made a concerted effort to eliminate the remaining outstanding deficit by setting aside $5 million to help pay it down in the 2015 county budget, and an additional $1 million in the 2016 county budget. The Legislature’s effort to include $4 million for deficit reduction in the 2017 budget was vetoed. The Legislature formalized a fund balance management policy by adopting Local Law No. 4 of 2013, cited by both Fitch and S&P Global Rating as necessary for the Country’s overall financial resilience. The Legislature, in each year since the Deficit Financing Act was passed, has responded to the advice of the state Comptroller’s Office and the signals sent by credit rating agencies to pay down the deficit, restructure revenues and address challenging expenditures. A steadily improving economy, both regionally and nationally, has contributed to the improvements of Rockland’s overall fiscal condition. Earl also acknowledged the work of the Administration in trying to better the county’s finances. Among the issues still to be addressed: Paying down the remaining deficit, determining the future uses of vacant government office space in New City and Pomona, and avoiding breaking the tax cap.